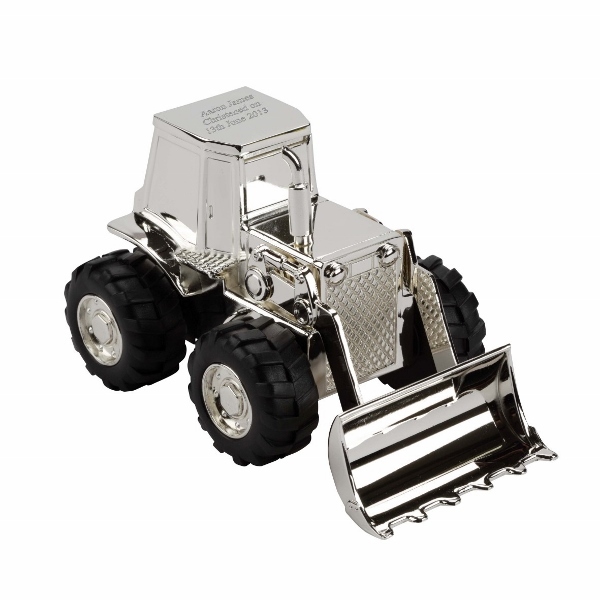 Personalised Engraved Digger with Scoop Money Box. This beautiful silver plated money box measures 14 x 8 x 8 cm. Your engraving will be on top of the cab of the digger. The money slot is on the reverse of the digger cab. It has a fully operational scoop/bucket and wheels! The black tyres are rubber. It makes a perfect Christening Gift and also great for a 1st Birthday or New Arrival present. Why not purchase it as a momento for a Baby's 1st Christmas!